The body of the Antoria No. 2355 is an Arched spruce top with selected birch back and rims. The neck is hard laminated maple and is a set in neck. The fingerboard is ebonized rosewood with pearloid inlays. It has two chrome plated Super 70 Anti-Hum pickups, a chrome tailpiece and machine heads. The finish is Brown Sunburst. Full length is 40&1/2", Width 20&1/4" X 16". 20 Frets and a 24&3/4" scale Length. It was also available as No2355M with curly maple top, back and rims. 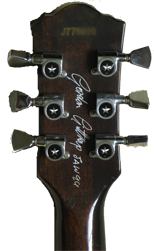 The guitar pictured was made in 1977 and was previously owned by Gordon Giltrap. It's a beautiful guitar to play and sounds great acoustically or amped up. The Ibanez equivalents have the same model numbers. Those with the Ibanez branding tend to command a higher price, and occasionally you can pick up the Antoria models at a very reasonable price if you are lucky.